He then tweeted a photo of the cover of the super-secret script (above), showing the episode’s title, writer, and director. 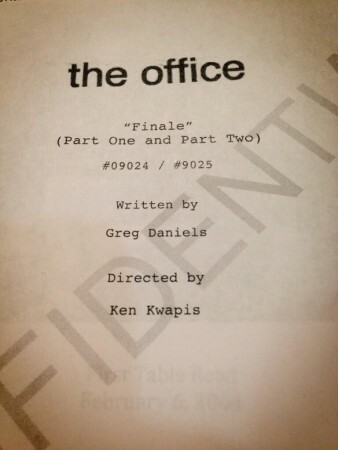 The Office will sign off on May 16th after nine seasons on the air with a special one hour series finale. What do you think? Are you going to tune in to NBC that night? I don’t know if I will watch or not. Writers have really screwed up in my opinion ******** with the relationship of Pam and Jim. There relationship is what held the show together. Maybe its good its going off because the writers are really searching for something to write about. Really disappointing. Sad that the office is ending – will watch season finale but kind of won’t want to. This show has brought lots of joy to the television-viewing public.